On opposing sides of a huge collapse in the eco-park El Toh there are two underwater caves. Simon and Donna Richards, the original explorers, named them Jaguar Cave and Tortoise Cave. These two caves are North of the Dos Ojos cave system, and adjacent to cenote Dos Palmas. 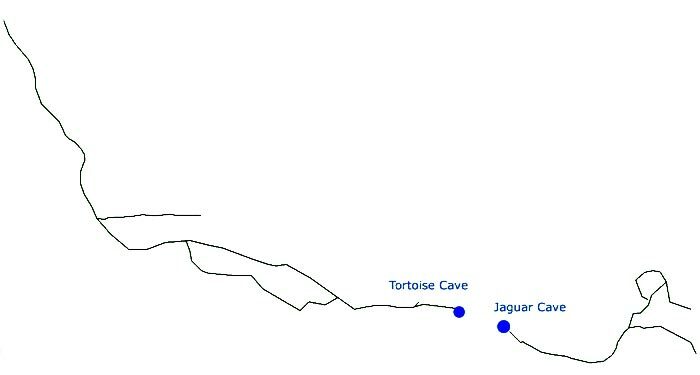 Between 2004 and 2005 Simon and Donna explored 2483 feet / 757 meters in Tortoise Cave and 1798 feet / 548 meters in Jaguar Cave. At the end of 2009 the owner decided to open the area to the public and I was invited to continue exploring the caves. 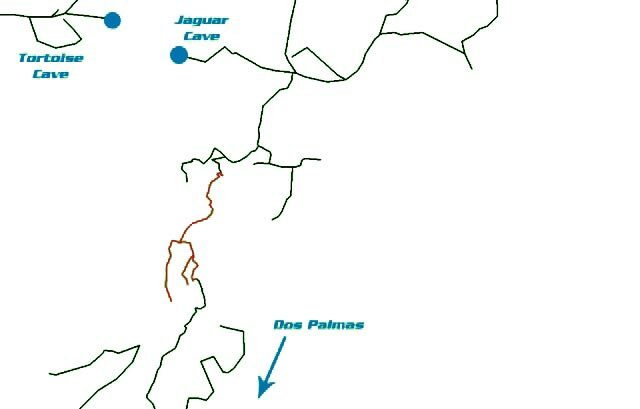 Between February and August 2010 I explored 8566 feet / 2611 meters of new passages in the Jaguar Cave. 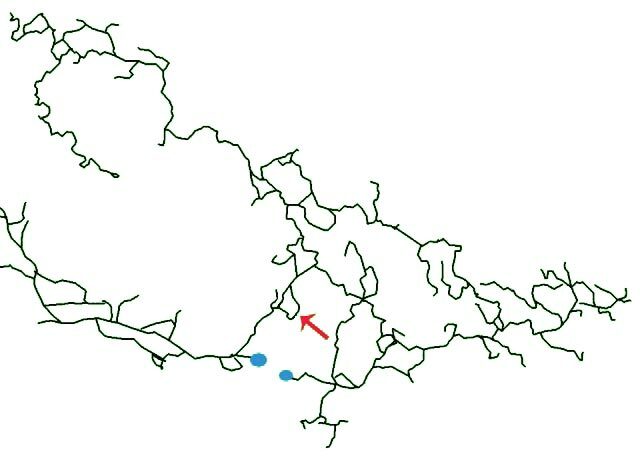 The cave extends in three directions: one upstream towards the South, which has intense flow but very small sections; another upstream flow towards the North, with a weak flow; and finally, a wide but low flow downstream section towards the East, consisting of parallel passages. 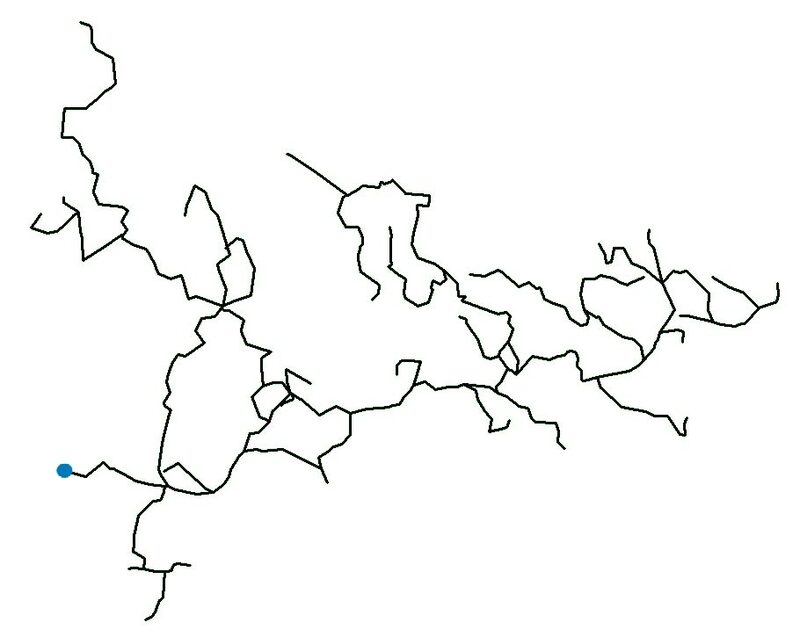 Percolation is intense in the downstream section and visibility can be reduced to zero in a very short period of time. Small mammal bones can be found in a dead end section, but by my estimation they aren’t very old nor are they of any scientific significance. Even if the total length of the cave passages is significant, 11440 feet / 3487 meters, it is not yet possible to call it a system, as a secondary exit has not yet been found. In Tortoise cave, Mauro B. and Patrick W. explored adding 6669 feet / 2033 meters of new passages. 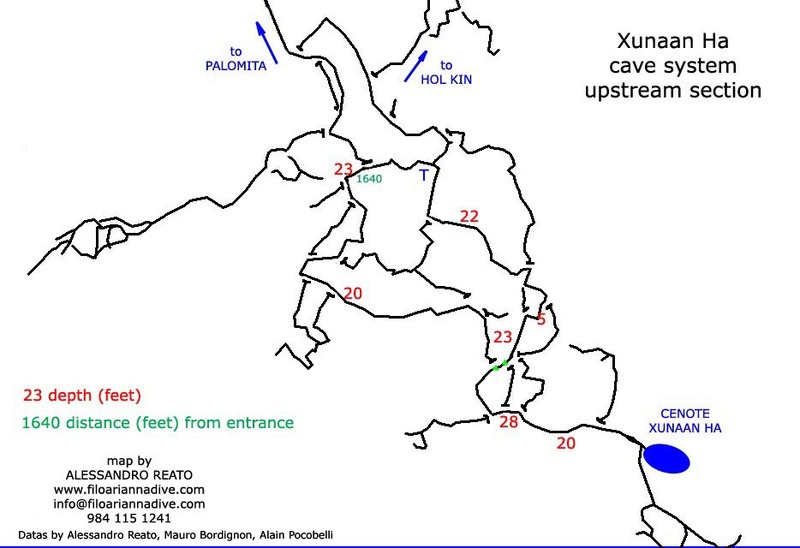 Between September and November 2010, I continued to explore the cave’s northern side, which is very promising. There are dunes of silt surrounded by a forest of white stalactites. The sight is absolutely breathtaking. On November 7, 2010, while taking advantages of a particularly intense flow, I was able to find a lead at the end of a bedding plane, passing a couple of narrow restrictions, I connected the entrance of Tortoise Cave to Jaguar Cave. 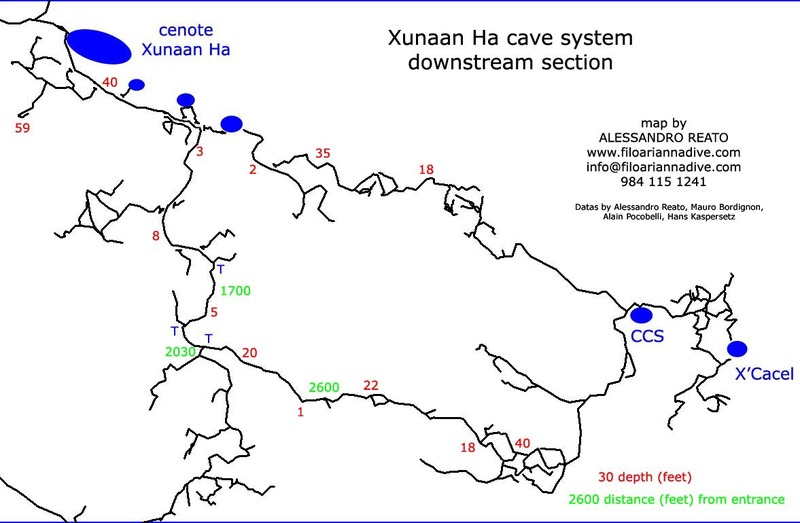 The two caves now form a System. Taking the name of Balun Actun, the Mayan translation of Jaguar Cave. The total length of all the passages connected is 27,690 feet / 8,440 meters, which makes this system the sixteenth longest in the list of larger submersed cave systems of Quintana Roo at the date. 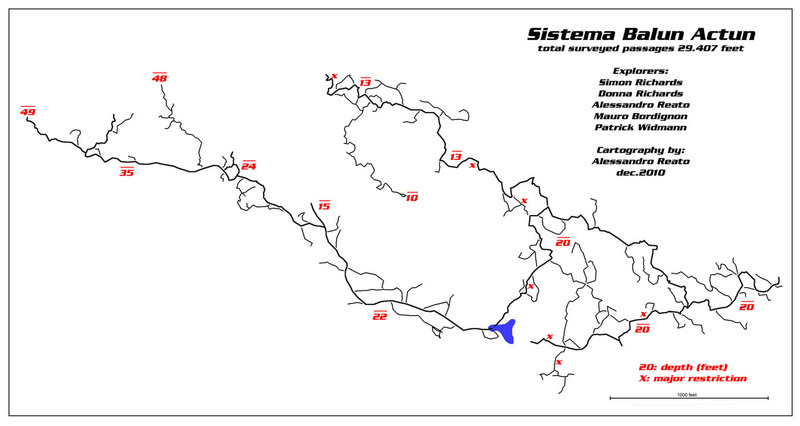 After some other explorations on the northern side of the system, in April 2011, given the proximity to the Dos Ojos cave system, I made some dives from cenote Dos Palmas, to check the accuracy of the existing survey. Those dives permitted me to correct an error of about 300 feet and to extend the exploration to the North by about 120 feet. The distance between the two systems was about 240 feet, but it was necessary to explore 700 feet of passages before finding the crux, which then permitted me, on April 7, 2011, to connect the two systems Balun Actun and Dos Ojos. This connection enlarged the underwater caves system of Dos Ojos by 32,487 feet / 9902 meters. At that time it made Dos Ojos the third largest submersed cave system of the World, including 258,343 feet / 78,743 meters of underwater caves.